Orca whale watching is very popular off Vancouver Island in British Columbia, Canada and each one of the whales have had their picture taken numerous times. Whale watching off Northern Vancouver Island and Southern Vancouver Island has become more popular every year and people from all over the world come to Canada to view Orca Whales in their natural environment. This is a great experience for everybody as they are be able to watch what these whales do on a daily basis. You are now in the whales territory and while aboard a whale watching tour, there are rules that boat captains need to abide by. An abundance of research has been done on these whales over the years and the Northern Resident Killer Whales as seen in this picture are fairly easy to identify. This pod is just one of many that are usually seen in the waters off Northern Vancouver Island at least once during the months from July to October each year. 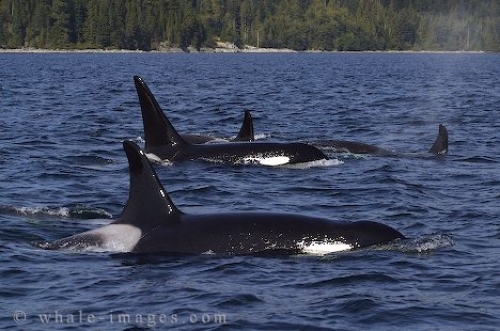 Photo of a pod of Orca Whales resting off Northern Vancouver Island in British Columbia, Canada. Most of the pictures that researchers try and take are from the left side of the whale as this is how the identification program began. The Orca in the foreground gives you an excellent view of its saddle patch which is one of the ways to tell each Killer Whale apart as well as their dorsal fins. This pod is lounging around and resting in the waters off Northern Vancouver Island in British Columbia as the sun glistens off their backsides and dorsal fins. This is a typical behaviour seen when each Orca family swims together and gives whale watchers the perfect opportunity to snap a family picture or two.